This story was originally published in the East Bay Express on April 20, 2016. 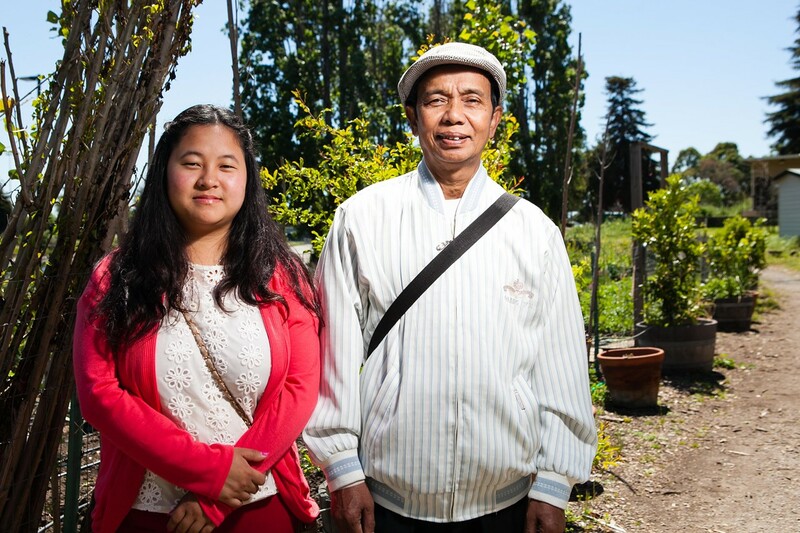 Paw Kut Tee and her father Sein Win grow food together in the Intergenerational Food Justice Internship program through the International Rescue Committee and Oakland International High School. Photo by Bert Johnson/East Bay Express. In 1997, when the ongoing civil war in his native Burma made it impossible for him to continue working, Sein Win knew it was time to leave. Following other refugees to Thailand, Win said he thought the move would only be temporary, that he, his wife, and their three daughters would be able to return when the war ended. Instead, they lived in a refugee camp for fourteen years. One day in 2010, Thai government officials told Win his family could apply to live in the United States. Win was eager to leave the camp, hopeful that he could receive medical treatment for several chronic health problems, and optimistic that his children would have better opportunities in America. After a year of waiting and three days in transit, Win’s family landed at the Oakland International Airport and settled in Oakland. Without knowing any English, Win said it was difficult to navigate the city or to connect with any of his new neighbors. But when his daughter, Paw Ku Tee, told him about a new gardening and cooking program at her high school that pairs refugee elders with youth, he jumped at the chance to participate. A farmer in his former life in Burma, Win had spent years on the land, growing wheat, rice, and vegetables to sell. The Intergenerational Food Justice Internship teaches high school-aged refugees how to grow vegetables, how to prepare healthy foods (often through storytelling and with recipes from the elders’ home countries), and about food justice, said Deepa Iyer, a program manager for the International Rescue Committee (IRC), which runs the program. Founded in 1933, the IRC assists newly arrived refugees with resettlement, operating 26 offices across the country, including one in Oakland. The internship is an offshoot of the IRC’s New Roots program, an urban farming initiative that got its start in 2007 in San Diego after several Somali refugees approached the IRC about establishing a community garden, according to IRC program coordinator Zack Reidman. Reidman helped establish the IRC’s first community garden in the East Bay in 2012. Reidman said the IRC was able to secure space behind Laney College in Oakland, where a cohort of roughly two dozen refugees succeeded in turning a dumping ground for woodchips into neat rows of vegetables and leafy greens. Unlike many city-sponsored community gardens, where gardeners are mostly hobbyists, Reidman said many of the women and men who work the land through the New Roots program come with years of experience in subsistence farming. They need little assistance in establishing or maintaining the space. In San Diego, the urban farms are large enough to produce food that the refugees can then sell to augment their income, but land is much more limited in the East Bay, Reidman said. Instead, the New Roots program in Oakland — which now includes a second garden at the Glenn Daniel King Estates Park, a city-owned open space in East Oakland — has been able to provide spaces where refugees can both connect with other people of similar ethnic or cultural backgrounds and carry on the agricultural traditions of their cultures. Tee was sixteen when she arrived in the Bay Area, and it was the first time she had ever seen a city. Living most of her life in a refugee camp that had been carved out of a jungle, Tee said her family maintained a garden to subsidize their monthly allotments of rice, yellow beans, oil, and salt. When she arrived in the United States, Tee said it was difficult to complete even seemingly simple tasks, such as grocery shopping in American supermarkets. The idea that foods could contain added sugars, sodium, and other preservatives was also foreign. It’s a common experience for many refugees the IRC resettles, Iyer said. So, in addition to offering space to grow food, Reidman said the New Roots program also strives to educate refugees about the complex corporate structure of the American food system, including how to read labels on food packaging, and how to source culturally appropriate, healthy food within a limited budget. As the New Roots program has grown, so too has its mission, Iyer said. While it began as a way to reconnect refugees with the land, the program has taken on new roles, including deepening its focus on food security and nutritional education. When the IRC first hired Iyer in 2014 as program manager, she immediately began thinking about how to integrate youth into the work the IRC was already doing. It seemed only natural to establish a formal partnership with the Oakland International High School, which already has a community garden and was already serving refugee youth. It didn’t hurt that Reidman, who had for several years been helping to coordinate the New Roots program, also taught a community gardening and cooking program at the school. Within their first five years in the United States, immigrants are statistically more likely to suffer from high blood pressure and diabetes than non-immigrants, Iyer said. It was with this phenomenon in mind, and with the knowledge that the most experienced farmers are often recent migrants, that she and Reidman developed the youth internship program. The six-week summer course has now grown into a three-season program, which students can participate in for one semester or for consecutive semesters throughout the year. Youth in the program interview family members and relatives about their relationships to food and agriculture. They cook with elders and visit urban farms in the Bay Area. And recently, Iyer said they have been experimenting with the idea of having participants carry out community-based projects, which may include growing and delivering fresh produce to newcomers in need or augmenting their high school’s lunch offerings. Although Tee graduated last year from Oakland International, she and her dad continue to participate in New Roots. Tee said she just likes working in the garden, and it’s a good opportunity to practice speaking English. For Win, it reminds him of when he was farming in Burma.